Gimpel3D 2D/3D Stereo Conversion Editor converts single images or frame sequences into stereoscopic 3D using a combination of traditional approaches and a proprietary projective 3D modelling system. 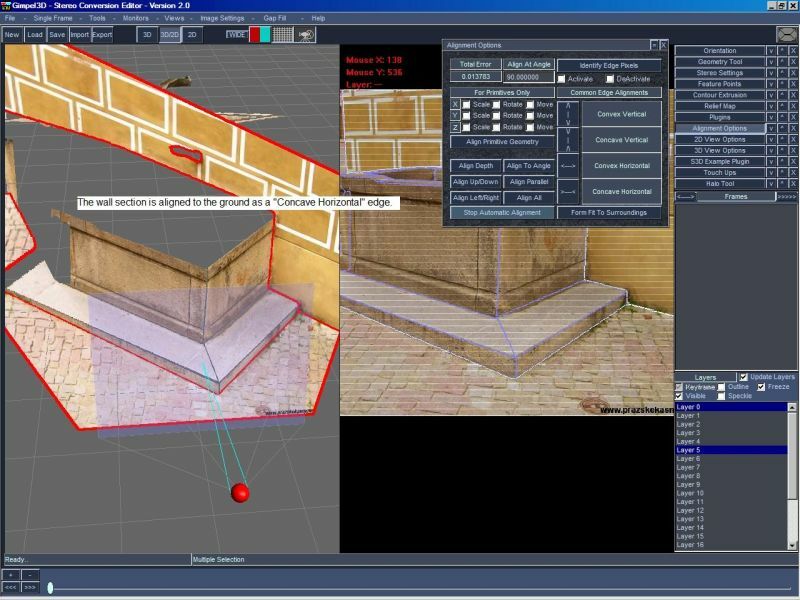 The user works in true proportional 3D space where the scene can be viewed from any location. The scene is edited geometrically in space using tools specifically designed to work with the perspective projection of the image. 2D/3D Editor - Converts still images and video to stereoscopic 3D. * - Wide selection of tools allow for any level of detail. * - Easy construction of regular geometry using Auto-Alignment. * - Complex scenes can be modeled geometrically and re-used. * - Surfaces can have physical contour and/or relief texturing. * - Custom models and/or depth maps can be applied selectively. * - Real-time anaglyph stereo view provides immediate visual feedback. * - Objects and stereo settings can be animated and key-framed. * - Multiple options for gap-fill and post-processing. * - Transfer edits between varying resolutions. * - Can import data to leverage existing pipelines and/or content. * - Can also be used as a start-to-finish solution. * - Extensive help documentation and examples. Qweas is providing links to Gimpel3D 2D/3D Stereo Conversion Editor 2012 as a courtesy, and makes no representations regarding Gimpel3D 2D/3D Stereo Conversion Editor or any other applications or any information related thereto. Any questions, complaints or claims regarding this application Gimpel3D 2D/3D Stereo Conversion Editor 2012 must be directed to the appropriate software vendor. You may click the publisher link of Gimpel3D 2D/3D Stereo Conversion Editor on the top of this page to get more details about the vendor.